Should our Giant Flying Fish be your first mega-kite? Measuring in at a giant 22.5 feet long the Giant Fish Kite from Premier is amazingly docile for its size. Easy to launch, smooth and steady in the sky, you will be amazed at just how easy this kite is to fly. Juergen's Giant fish is the perfect first mega-kite for any kite flier. With a little instruction, even a first time flier (with a pair of gloves) could handle this gentle beast. 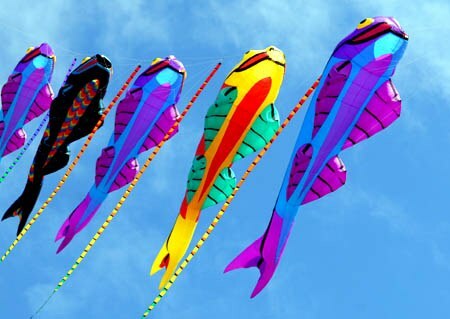 Designed by Juergen Ebbinghaus of Germany, and manufactured by Premier Kites this Giant Fish kite a guaranteed crowd pleaser. Our Giant Fish requires no assembly and has an extremely wide wind range. It is one of the easiest mega kites to fly. Around here, the Giant Fish gets a lot of airtime because it is such an easy and reliable crowd pleaser. When we do sky shows, with our Berkeley Kite Wrangler team we love the Giant Fish because we know it will always entertain. When we performed at an event un Utah in 2008 and there wasn’t even a lick of wind, we towed a five stack from an ATV. It was amazing! Another reason we like Juergen’s Giant Fish so much is that it is such a great value (about $26 per foot!). Comparable giant creature kites can cost six times this price or more. Although many large (and much more expensive) inflatable kites need pilot kites for steady flight, that’s not the case with the Giant Fish. No pilot kite necessary with the Giant Fish, not even in strong winds! At your next beach party of fish fry, your friends are going to love this one when they see it fly! 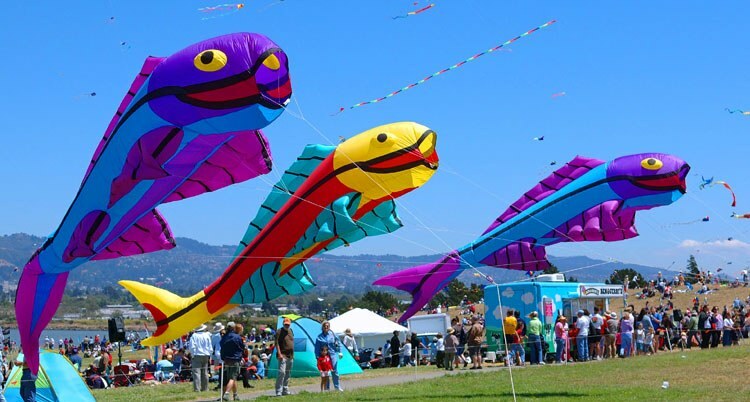 If you need help learing how to fly giant kites like the Premeir Giant Fish Kite, just visit our “Solar-Powered Kite Mobile” in Berkeley and we’ll show you the ropes and get you flying your Giant Fish kite in no time. Click the button below to add the Giant Flying Fish, Red to your wish list.